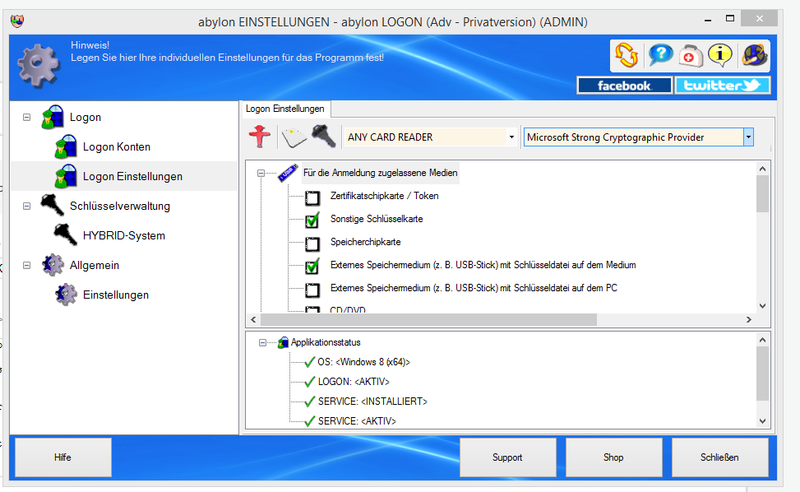 Protect your computer from illegal access with Abylon Logon. 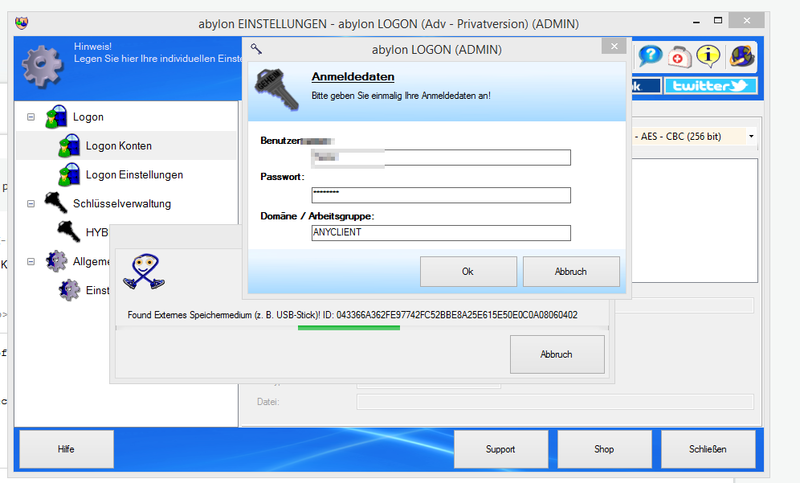 Abylon Logon 12.9 PRV was available as a giveaway on April 16, 2015! 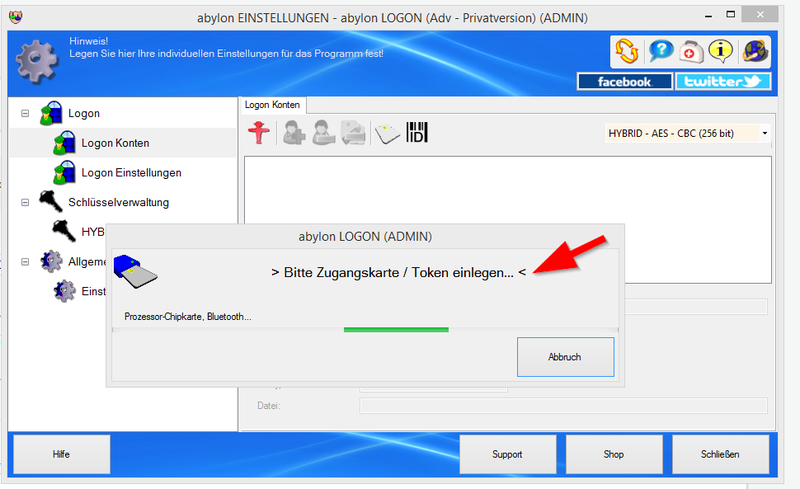 Protect your computer from illegal access with Abylon Logon. All you have to do is to save your Windows login data to a smart card, a removable media (e. g. memory stick) or a CD. From now on you need only this physical key for the login authentication. After the work is done, just pull out the removable disk and your computer will turn off automatically. The program will easily protect your computer against snoopy visitors and data theft. Random password: Daily automatic Windows password change (optional). How would you improve Abylon Logon 12.9 PRV? The encrypted drives can be opened with passwords, chip cards, USB sticks (flashdrives), CD or (PKCS) certificate. Get an access to them like to a normal drive in File Explorer. During every file operation the encryption works transparently on the background. If you lose your notebook, the closed drives will be invisible and protected like a safe. Can you keep all passwords and access data in your mind? The abylon KEYSAFE is a simple password manager to manage all your secret data. You need only one password or alternatively a USB Stick, CD, chip card or certificate as “keys”. The stored data can simply be pulled with a mouse into the appropriate fields of the Browsers or dialogue (Drag&Drop). The protection of the computer and stored files against undesirable access is very important. This comprehensive software package offers innovative and professional security and encryption modules for private and business use. Beside the password- or certificate-based encryption you can protect the computer against ineligible access or files removal. Abylon BACKUP TUBE creates exact copies of all files and directories. The backup or synchronization can be done automatically or manually. Intelligent routines speed up the backup process and reduce the amount of data. Only changed or new files are copied to the backup store. WLAN-LIVE-SCANNER checks regular intervals of any available wireless network and lists them in a clear tree structure. Network name (SSID), connection status, network type, encryption algorithm and signal strength are displayed as additional information. With one click the connection to the selected network is established, despite the access is free, public or already used. I did not read through all of the comments, but can't someone just take your USB key while you are sleeping and access your computer? Feels like a security breach to me. No thanks. As for protecting your information, as others have said, it MUST encrypt your files, or any old slob could get all your information with a boot disk, or by plugging the HDD (or SSD) into another PC. Even the recovery console could be used to steal your information, if the person knows what they are doing. My PC has a built-in "smart card" which encrypts the data based on my board's ID. For this reason, it is slightly safer for me to use this, but the obvious weakness is a boot disk. Sure, I could set up a bios password, but then what is the point of using this? I still need to enter a password. As for protecting your information, as others have said, it MUST encrypt your files, or any old slob could get all your information with a boot disk, or by plugging the HDD (or SSD) into another PC. Even the recovery console could be used to steal your information, if the person knows what they are doing. My PC has a built-in "smart card" which encrypts the data based on my board's ID. For this reason, it is slightly safer for me to use this, but the obvious weakness is a boot disk. Sure, I could set up a bios password, but then what is the point of using this? I still need to enter a password. I am far from PC like the people controlling this. I'll just state what others have said. A free Linux Live CD/DVD/USB will bypass this quicker than you can boot Windows. Quite true. If you know what you are doing, you can break the Windows password in less that a minute, and boot to Windows, or just grab all the info you want through the boot disk's programs. Not if the computer has the newer UEFI bios it isn't. It doesn't allow booting unsigned drives. Edward Snowden was interviewed recently where he discussed passwords, his recommendations were not long complex passwords with symbols and case changes but much simpler and easier to remember use of pass phrases. Remembering a well-known to you phrase is much easier to remember than some complex mixture of meaningless symbols and letters. This could easily be hidden in plain sight amongst the many text files that exist on most people's hard drives, certainly a method I'm going to look into just to see how convenient it is or not. Edward Snowden was interviewed recently where he discussed passwords, his recommendations were not long complex passwords with symbols and case changes but much simpler and easier to remember use of pass phrases. Remembering a well-known to you phrase is much easier to remember than some complex mixture of meaningless symbols and letters. This could easily be hidden in plain sight amongst the many text files that exist on most people's hard drives, certainly a method I'm going to look into just to see how convenient it is or not. In many cases, safety and convenience disagree. In case of the windows login the software abylon LOGON tried a to move it a little in the direction of security. Getting beyond the Windows logon is somewhat trivial if you have unfettered access to the PC/laptop. People forget passwords so this is something you can Google -- you don't have to visit the darkest corners of the Internet in search of info. If you use a laptop it's probably more subject to theft or loss, because you take it with you when you leave your home. In that case you'd want to use encryption, so if the bad guys get their hands on it they've got your hardware but nothing else. The same applies to cells & tablets. In a biz environment where it's harder to limit physical access to PCs/laptops this sort of setup is somewhat common. At home I think the average person is likely to leave their key at their desk, providing little benefit over a strong password written on a piece of paper stored under the keyboard. If you log into a Windows admin account you don't need to provide that password once you're logged on -- you do have to use an administrator password to perform certain tasks if you log into a limited account -- so using a stronger login password when you sign into Windows as admin on your personal PC at your desk at home may not mean all that much. OTOH if you've got kids that aren't old enough to hack around such things, it might be useful. Some folks talk about the bios as an alternative or to increase security... Generally you Don't want people going anywhere near the bios, since a simple error on their part could render the PC/laptop unusable. If you're experienced, accept the risk & consequences, of course making settings in the bios is fine. Many bios let you set a password to enter the bios itself -- it's normally not a huge deal to remove a bios password. That said, if someone has free enough access that they can [re] boot a system, your best protection is as already posted encryption. TrueCrypt BTW passed the 2nd phase of the audit, while Veracrypt is strengthening the original Truecrypt code & available right now free. All this being said, nowadays the so-called Threat Landscape is such that it's fair for anyone to assume that they've been compromised -- decide what level of paranoia you're willing to live with. It's near impossible to tell if a PC's/laptop's EUFI bios or your hard drive's firmware has been compromised. You can scan for malware files all you want -- malware can live in the registry instead of being stored in a file, & if you have a root or boot kit infection, your OS is blind to those files anyway. You don't click on anything unknown, don't open e-mail attachments etc., BUT, visit a major, normally safe site when there's a malvertising campaign going on & you could be toast. Or perhaps your router's been reprogrammed, or the cable modem's been hit. What looks like a typical wall wart could be intercepting every stroke from your Microsoft wireless keyboard & sending that data over a cell network. Devices like smart watches &/or those that make up the Internet of Things are seldom designed for security. And even if your system(s) are completely free of malware, loads of data on you is stored elsewhere, & those data banks have most likely been breached. A while back they found that some credit card readers had hardware for recording & exporting card data inserted at the factory. Who monitors or controls what gets stuck in with electronics, or how they're programmed? They found one cell phone maker was inserting spyware in the OS -- are/were they the only ones, or just the only one doing it poorly enough that they got caught? Local law enforcement [& who else?] may be using fake cell towers. It's been published that the NSA has the encryption keys for millions of sim cards -- if true, are they the only US agency that hasn't had bad guys working for them, &/or hasn't been hacked? I mean it's gotten to the point where a working stolen credit card number & pin may only be worth a dollar or two in bulk. The good news is that, with the exception of ransomware [which can target anybody], basic security measures can mean you're not a preferred target. The 2015 Verizon Data Breach Investigations Report (DBIR) says: "99.9 percent of exploited vulnerabilities had been compromised more than a year after a CVE was published and patched. Older vulnerabilities, some going back to 1999, were exploited in breaches in 2014, with a steady diet of CVEs from 2007, 2010 and 2011 at the forefront of breaches.". And Verizon doesn't deal with small fry like you & I. It was also published that most people filing taxes on-line in the US do so over unsecured wi-fi. There are more-or-less mercenaries that do nothing but develop exploits & malware, &/or find bugs or vulnerabilities, but that sort of work's expensive, so most criminals & spy types go for the low hanging fruit. If it helps at all... Getting beyond the Windows logon is somewhat trivial if you have unfettered access to the PC/laptop. People forget passwords so this is something you can Google -- you don't have to visit the darkest corners of the Internet in search of info. If you use a laptop it's probably more subject to theft or loss, because you take it with you when you leave your home. In that case you'd want to use encryption, so if the bad guys get their hands on it they've got your hardware but nothing else. The same applies to cells &amp; tablets. Software like Abylon Logon usually forces the use of stronger passwords -- the type that people hate to use because they're difficult to remember. What I didn't see with an admittedly quick look is anything about creating a duplicate key -- you don't want to rely on a single USB stick for example, but have a backup in case it fails. Abylon LOGON SSO Pro does provide for an administrator card, I assume for when hardware IDs are lost or break. I didn't see anything about biometric devices [though again just took a quick look], but I'd guess they'd come with their own software anyway. [Biometric authentication is not a perfect solution BTW -- Google for info, e.g. how fingerprint scanners can be fooled.] In a biz environment where it's harder to limit physical access to PCs/laptops this sort of setup is somewhat common. At home I think the average person is likely to leave their key at their desk, providing little benefit over a strong password written on a piece of paper stored under the keyboard. If you log into a Windows admin account you don't need to provide that password once you're logged on -- you do have to use an administrator password to perform certain tasks if you log into a limited account -- so using a stronger login password when you sign into Windows as admin on your personal PC at your desk at home may not mean all that much. OTOH if you've got kids that aren't old enough to hack around such things, it might be useful. Some folks talk about the bios as an alternative or to increase security... Generally you Don't want people going anywhere near the bios, since a simple error on their part could render the PC/laptop unusable. If you're experienced, accept the risk &amp; consequences, of course making settings in the bios is fine. Many bios let you set a password to enter the bios itself -- it's normally not a huge deal to remove a bios password. That said, if someone has free enough access that they can [re] boot a system, your best protection is as already posted encryption. TrueCrypt BTW passed the 2nd phase of the audit, while Veracrypt is strengthening the original Truecrypt code &amp; available right now free. All this being said, nowadays the so-called Threat Landscape is such that it's fair for anyone to assume that they've been compromised -- decide what level of paranoia you're willing to live with. It's near impossible to tell if a PC's/laptop's EUFI bios or your hard drive's firmware has been compromised. You can scan for malware files all you want -- malware can live in the registry instead of being stored in a file, &amp; if you have a root or boot kit infection, your OS is blind to those files anyway. You don't click on anything unknown, don't open e-mail attachments etc., BUT, visit a major, normally safe site when there's a malvertising campaign going on &amp; you could be toast. Or perhaps your router's been reprogrammed, or the cable modem's been hit. What looks like a typical wall wart could be intercepting every stroke from your Microsoft wireless keyboard &amp; sending that data over a cell network. Devices like smart watches &amp;/or those that make up the Internet of Things are seldom designed for security. And even if your system(s) are completely free of malware, loads of data on you is stored elsewhere, &amp; those data banks have most likely been breached. A while back they found that some credit card readers had hardware for recording &amp; exporting card data inserted at the factory. Who monitors or controls what gets stuck in with electronics, or how they're programmed? They found one cell phone maker was inserting spyware in the OS -- are/were they the only ones, or just the only one doing it poorly enough that they got caught? Local law enforcement [&amp; who else?] may be using fake cell towers. It's been published that the NSA has the encryption keys for millions of sim cards -- if true, are they the only US agency that hasn't had bad guys working for them, &amp;/or hasn't been hacked? I mean it's gotten to the point where a working stolen credit card number &amp; pin may only be worth a dollar or two in bulk. The good news is that, with the exception of ransomware [which can target anybody], basic security measures can mean you're not a preferred target. The 2015 Verizon Data Breach Investigations Report (DBIR) says: "99.9 percent of exploited vulnerabilities had been compromised more than a year after a CVE was published and patched. Older vulnerabilities, some going back to 1999, were exploited in breaches in 2014, with a steady diet of CVEs from 2007, 2010 and 2011 at the forefront of breaches.". And Verizon doesn't deal with small fry like you &amp; I. It was also published that most people filing taxes on-line in the US do so over unsecured wi-fi. There are more-or-less mercenaries that do nothing but develop exploits &amp; malware, &amp;/or find bugs or vulnerabilities, but that sort of work's expensive, so most criminals &amp; spy types go for the low hanging fruit. The only truly safe computer in the world belongs to Chuck Norris. If your smart card or CD or removable media is faulty or damaged, then you cannot use your PC anymore. The software randomly changes the password every day? Then do you, the user know the new password that is randomly changed every day? If your smart card or CD or removable media is faulty or damaged, then you cannot use your PC anymore. Quote "Random password: Daily automatic Windows password change (optional)." UnQuote The software randomly changes the password every day? Then do you, the user know the new password that is randomly changed every day? You don't know? the function "Random Password" is a an additional option. In this case, however, you can still log-in by SecureID or spare key. And what will be after license is over (1 year)? What is missing in this program is an alternative way of accessing your computer if the flash drive is faulty such as entering a password. On some sumsung galaxy tablets and smartphone when you choose to use fingerprint identification you also have the option of entering a password should the fingerprint scanning fail. If you keep your flash drive next to the computer then chances are that both can be stolen. I don't think this program offers a backup flash drive option. The only advantage is a quick way to access your computer rather than enter a password which you can forget but still a worry about having the flash drive fail. What is missing in this program is an alternative way of accessing your computer if the flash drive is faulty such as entering a password. On some sumsung galaxy tablets and smartphone when you choose to use fingerprint identification you also have the option of entering a password should the fingerprint scanning fail. If you keep your flash drive next to the computer then chances are that both can be stolen. I don't think this program offers a backup flash drive option. The only advantage is a quick way to access your computer rather than enter a password which you can forget but still a worry about having the flash drive fail. as written, you can also switch to normal Windows Login-mask with abylon LOGON or alternatively enter an individual SecureID. Of course, you could set a BIOS master password, but it's almost a lost cause with laptop users, and you'll have to remember it. If there is only one computer at home, perhaps a more simpler and efficient way is using a fingerprint reader (FPR). There are integrated (laptops) and external FPR. Fingerprint software (some Windows versions can make use of FPR) do much more than just authorize log on. This said, anyone with a Windows live CD and a Linux live CD ---and the will--- can access anything on a PC: remove administrator password, walk through the registry, sneak a peek at personal files, etc. The USB port can reveal unreliable. That's why many devices (e.g POS) depend on a serial port. Often for such devices, a USB-RS232 adapter is not an alternative. Of course, you could set a BIOS master password, but it's almost a lost cause with laptop users, and you'll have to remember it. If there is only one computer at home, perhaps a more simpler and efficient way is using a fingerprint reader (FPR). There are integrated (laptops) and external FPR. Fingerprint software (some Windows versions can make use of FPR) do much more than just authorize log on. This said, anyone with a Windows live CD and a Linux live CD ---and the will--- can access anything on a PC: remove administrator password, walk through the registry, sneak a peek at personal files, etc. #2 (bill) The USB port can reveal unreliable. That's why many devices (e.g POS) depend on a serial port. Often for such devices, a USB-RS232 adapter is not an alternative. This is not so easily done on newer computers with EFI bios. <blockquote cite="remove administrator password, walk through the registry, sneak a peek at personal files, etc. "> This is not so easily done on newer computers with EFI bios. In what sense does locking a Windows operating system prevent someone from accessing your data? All a criminal needs to do is to boot up the computer using a live CD (eg Linux) and he/she can access and copy your files without needing to go into Windows. Maybe a BIOS lock would be more useful? In what sense does locking a Windows operating system prevent someone from accessing your data? All a criminal needs to do is to boot up the computer using a live CD (eg Linux) and he/she can access and copy your files without needing to go into Windows. Maybe a BIOS lock would be more useful? If you really want to protect your data it must be protected when the disk is removed from the system and this means encryption. This is correct. This software alone would not help against someone with a live Linux CD. You'd also need to encrypt the drive or user directory with the author's separately sold utilities. Why do so many people seem to feel that just because an encryption routine is "open source", it is safer? If anything, it's the opposite. Open source means you can view the code that creates the program therefore you can check if it has any back doors built in to it. This has been done with the open source versions of PGP, hope this helps you to understand why open source is so useful from a security point of view. Jim. Open source means you can view the code that creates the program therefore you can check if it has any back doors built in to it. This has been done with the open source versions of PGP, hope this helps you to understand why open source is so useful from a security point of view. "Why do so many people seem to feel that just because an encryption routine is “open source”, it is safer?" If you wanted to be super paranoid you might feel that there's no one you could trust, & there are a lot of people that feel that way. In that case you work around the premise that everything's compromised, perhaps avoiding digital electronics [e.g. it was published some gov agencies were moving to typewriters in Russia], or perhaps splitting sensitive encrypted files & storing the pieces separately, so even with the key, having one piece is useless. Many less paranoid people feel that if software is open source, then it's harder to hide something bad in the code because everyone can read it. If you read about the 2nd TrueCrypt audit, you'll see that sentiment echoed -- that it's harder to hide something like a back door. The TrueCrypt code passed BTW, with some recommendations that are being accounted for in a couple of TrueCrypt forks, e.g. Veracrypt. <i>"Why do so many people seem to feel that just because an encryption routine is “open source”, it is safer? "</i> If you wanted to be super paranoid you might feel that there's no one you could trust, &amp; there are a lot of people that feel that way. In that case you work around the premise that everything's compromised, perhaps avoiding digital electronics [e.g. it was published some gov agencies were moving to typewriters in Russia], or perhaps splitting sensitive encrypted files &amp; storing the pieces separately, so even with the key, having one piece is useless. Many less paranoid people feel that if software is open source, then it's harder to hide something bad in the code because everyone can read it. If you read about the 2nd TrueCrypt audit, you'll see that sentiment echoed -- that it's harder to hide something like a back door. The TrueCrypt code passed BTW, with some recommendations that are being accounted for in a couple of TrueCrypt forks, e.g. Veracrypt. Jim, Open Source also means that the "author" cannot die or go out of business. Car accidents happen. Development stops, bugs stay. Open Source means a team continues to work on it if it's a good program and desired by the computer community. Think of Linux. Then think of Windows if MS goes out of biz. Far fetched granted. 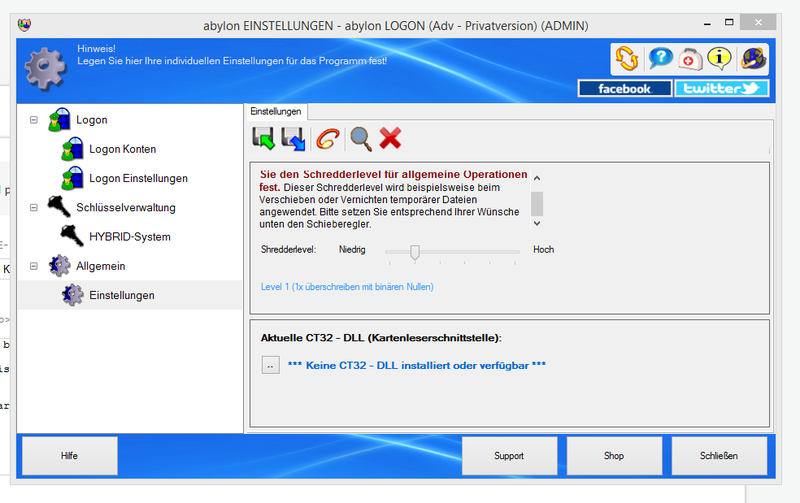 if you install "Abylon Logon 12.9 PRV" will this tool work:? what happens if you lose or damage memory stick? @alex if you install "Abylon Logon 12.9 PRV" will this tool work:? https://4sysops.com/archives/reset-windows-8-1-password-with-the-free-tool-ntpasswd/ what happens if you lose or damage memory stick? I assume from the comments here that many are not familiar with the new EFI bios that ships with most computers these days. They have done away with being able to just boot from a USB stick or DVD drive without turning off several security features built into the BIOS. The days of old are over. Of course this won't stop someone from pulling out your drive and reading the data from another computer but that is not what this offer today is trying to protect against. I assume from the comments here that many are not familiar with the new EFI bios that ships with most computers these days. They have done away with being able to just boot from a USB stick or DVD drive without turning off several security features built into the BIOS. The days of old are over. Of course this won't stop someone from pulling out your drive and reading the data from another computer but that is not what this offer today is trying to protect against. You may as well just set the bios to only boot to a USB boot disk. That way you don't have to worry if the boot disk fails...just change the bios. Who is going to think of looking in the bios. If you are worried just password protect the bios. Any recue disk available on the Net will do the job. For old installations such as mine, five years for reasons of program development, which become cantankerous I would be too scared of being locked out on bootup myself. the software abylon LOGON offers the opportunity to switch to the regular Windows Login and to enter an alternate SecureID. I did not use/try 'Predator' which also does the same job as today's Program. Freeware Alternatives : * Rohos Logon Key Free - http://www.rohos.com/products/rohos-logon-free/ ( the free version doesnt offer password change. It gives a simple way to log in via usb credentials alongside the manual windows log on. It can protect the computer when in the safe or hibernation mode. ) * VSUsbLogon- http://www.lokibit.com/products.htm * USB Raptor - http://sourceforge.net/p/usbraptor/wiki/Home/ I did not use/try 'Predator' which also does the same job as today's Program. Thanks, you've already mentioned that 'Rohos Logon Key Free' works alongside the normal windows log on . So in case of usb drive failure there's no need to worry . 'Rohos' just does the simple and desired job of bypassing the logon credential rather than entering password in every log on. 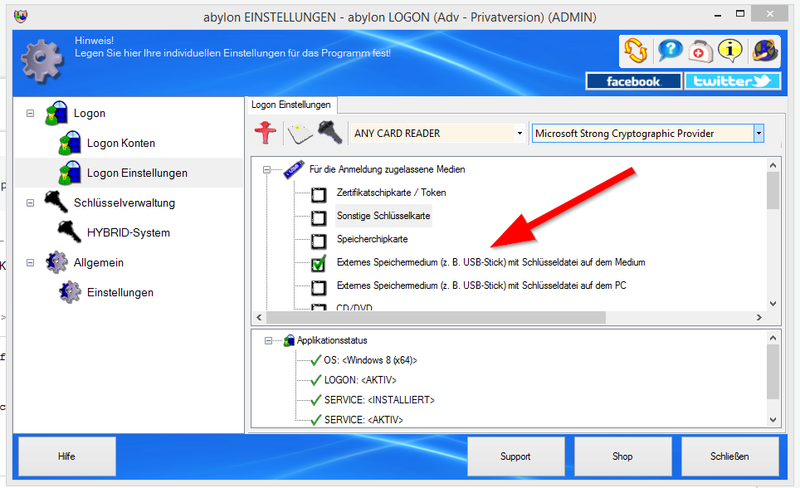 Even with abylon LOGON you can switch to the standard Windows login. This can be prevented as additional setting. Given having experienced numerous instances where USB memory sticks have completely failed ie denied recovery software any access, I would never allow a memory stick to control access to my laptop. USB Failures have occurred with different laptops and different memory sticks irrespective of their brand name or cost despite adhering strictly to my rule of never removing a memory stick until the operating system has shut down - even "safely remove" apps don't prevent failures. If a cd is used as the hardware, you'll be left high and dry if the driver for the cd/dvd drive gets corrupted on system shut down and the drive does not work on a subsequent reboot. Is there some way known only to the laptop owner of over-riding such failures? I have not even tested this app due to my concerns above. Of course, I may have misunderstood how the app works. You understood perfectly. I'm with you. The only hardware I want my system to depend on is its harddrive. I have had the experience of failed flash drives before and would not want to be in a position where I couldn't access my computer because of a faulty USB drive. Excellent point Bill if the stick were to become unusable or lost your allowing this to essentially control the access to your laptop or PC you would have to have some kind of fail safe or a backup to regain control of the computers access should a scenario like that occur . the software abylon LOGON offers the possibility to use as hardware key an USB sticks or chip cards. This software also enables the possibility to use multiple hardware keys at one pc. In addition, for each hardware key can be a SecureID created. This is a long string with which the user can log-in alternatively as emergency. Installed and registered without problems on a WIn 8.1.3 64 bit system. Hmmm... After start a colorful user interface opens. I didn't find the way to change the interface language to English, so the screenshots will be in German. You define a login account, which will be managed by this software. The installation requires some time. I entered an USB stick as login key. The software did not recognize my USB stick, it claimed to search a key card. My fault. You have to select the USB stick first. Now it recognizes the USB stick. You enter the login info and password. This will be stored on the stick - in future you can use this USB stick as your login key. In my test, this works without problems. The user interface is like the homepage. More "homemade" - the program itself makes a professional impression. I think you should only use this, if your normal Windows Logon is not safe enough for you. When any number of unknown persons have at time time physical access to your computers. For the normal home user this is overpowered - and simply not needed. Don't mess up your login procedure, if you have no real security concerns. For those in a high risk environment - recommended anyhow. Uninstalled via reboot. I work in a safe environment. For those using CryptoPrevent (I wrote about) - there is a new update. Installed and registered without problems on a WIn 8.1.3 64 bit system. A German company with all required legal information. This is a real "impressum": http://www.abylonsoft.com/impressum.htm We had a version 7 of abylon LOGON on March 16, 2010. Here are the very old reviews... http://www.giveawayoftheday.com/abylon-logon/ Hmmm... After start a colorful user interface opens. I didn't find the way to change the interface language to English, so the screenshots will be in German. http://i.imgur.com/XPPz91h.png http://i.imgur.com/DQARJ5J.png You define a login account, which will be managed by this software. The installation requires some time. http://i.imgur.com/OS2rR0i.png I entered an USB stick as login key. The software did not recognize my USB stick, it claimed to search a key card. My fault. You have to select the USB stick first. http://i.imgur.com/MDnMjst.png Now it recognizes the USB stick. You enter the login info and password. http://i.imgur.com/xHQK9ts.png This will be stored on the stick - in future you can use this USB stick as your login key. In my test, this works without problems. The user interface is like the homepage. More "homemade" - the program itself makes a professional impression. I think you should only use this, if your normal Windows Logon is not safe enough for you. When any number of unknown persons have at time time physical access to your computers. For the normal home user this is overpowered - and simply not needed. Don't mess up your login procedure, if you have no real security concerns. For those in a high risk environment - recommended anyhow. Uninstalled via reboot. I work in a safe environment. ---------------------------- For those using CryptoPrevent (I wrote about) - there is a new update. This could be useful if you use a laptop. This way even if your laptop is stolen, they will not be able to log into your computer. In addition, not needing to type your password to log in reduces your chance to have your account compromised. The problem is alex that they could get the data off your laptop hard drive by putting it into a USB caddie, what I do if I can't get a hard drive to boot and need some information from it. "For those using CryptoPrevent (I wrote about) – there is a new update." @XP-Man: That's why you use TrueCrypt (or BitLocker) on portable devices to keep your non-volatile storage from being read.